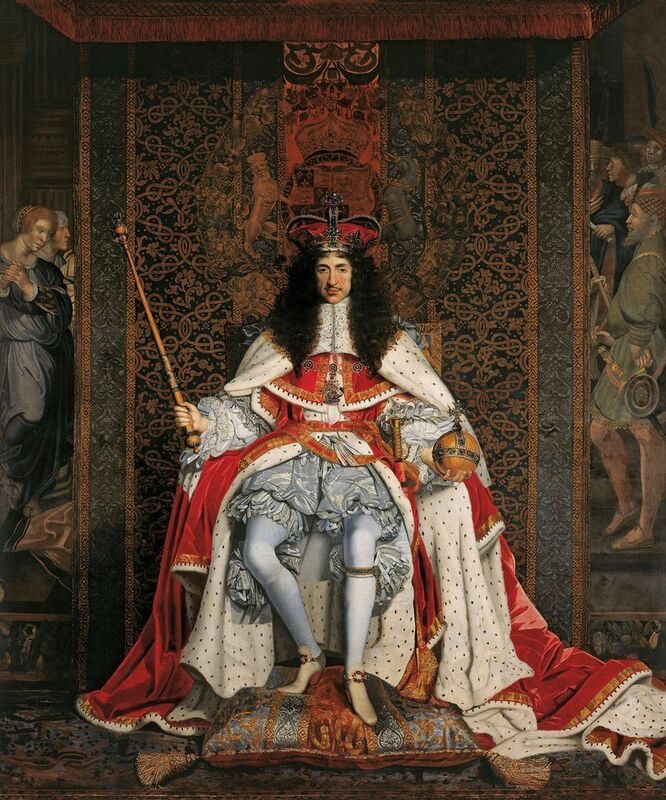 The superb Royal Collection exhibition, Charles II: Art & Power, has travelled to Edinburgh, where I live. But because the Queen’s Gallery in Scotland is much smaller than that in London, it seems only half the original show is on display. However, at the opening, the Royal Collection’s new director, Tim Knox, announced some better news for art lovers north of the border: John Michael Wright’s portrait of Charles II (around 1671-76), which until recently has hung in Hampton Court Palace, would now reside permanently in the state rooms at Holyroodhouse [The Queen’s residence in Scotland]. I was delighted to hear this because Wright’s portrait is one of my favourite paintings. Wright was a more astute observer of character than his rival Peter Lely, and no painting better captures the languid loucheness of Britain’s “Merry Monarch”. I went to see the picture the next day and found it in the Throne Room at Holyrood. It looks like it was always meant to be there, which is ironic, since the sitter himself never made it to the palace (despite being responsible for most of its construction). Wanting to share the good news, I tried to take a photo, but was swiftly (and very politely) asked not to. I do hope, though, that more Royal Collection pictures will soon make their way to Scotland. It’s hard not to think that Scotland gets a poor showing from the Royal Collection, especially in terms of Old Masters. The Queen has seven Rembrandts, 29 Van Dycks and 52 Canalettos, yet not one is on long-term display in Scotland. In terms of numbers, too, Scotland fares badly: according to the Royal Collection’s website, Holyrood has on display 224 paintings from a total of 5,573 across the collection. That’s just 4%. And if you take out the 104 paintings at Holyrood that are all by one artist (a series of Scottish monarchs by Jacob de Wet II) the proportion falls to just 2.15%. One of the Queen’s Van Dycks was the subject of much debate during the connoisseurship course I taught in December at the Royal Academy. We always run the course to coincide with the London Old Master sales, and this time we had the rare chance to compare almost identical versions of the same subject by the same artist, for both Christie’s and Sotheby’s were offering portraits of Princess Mary Stuart by Van Dyck. The Christie’s version was superb, full of unmistakably autograph touches. Recently cleaned, it deserved its estimate of £5m-£8m. Sotheby’s version was catalogued as by Van Dyck & Studio, was masked by old, discoloured layers of varnish, and was estimated at £600,000-£800,000. Which was “better”? Which came off the production line first? And how did their condition affect our visual judgement? Both portraits could lay claim to being one of the two originals known to have been commissioned from Van Dyck in 1641, the year he died. But muddying the waters was the presence of a third version in the Royal Collection, which was described by the late Oliver Millar (a scholar of Van Dyck’s English period) as being “a Van Dyck”.The provenance for all three falls tantalisingly short of taking them back to Van Dyck’s studio. Judging the attribution, therefore, must come down to connoisseurship. While the participants on my course agreed that the Christie’s version was the “best”, opinion was more divided over the relative merits of the Sotheby’s and Royal Collection versions (although we could only judge the latter via photographs). In the end, the market judged the Christie’s picture at £5.9m and Sotheby’s at £790,000. But we won’t be able to make a full comparison until we hang all three side by side. Holyrood Palace might be the ideal place to do it.